Morgan Arritola had a productive “training run” Saturday, Aug. 16 for her forthcoming trip to Casette di Massa, Italy and the 30th annual Mountain Running World Championships. Her “training” consisted of running 13.32 miles and 7,815 vertical feet to the 14,114-foot summit of Pikes Peak in Colorado. She did pretty well on a climb that averages an 11% grade. Arritola, 28, of Ketchum has qualified to be one of four female members of the U.S. team to the prestigious world mountain running competition in Italy on Sunday, Sept. 14. Two years ago, in Sept. 2012, Arritola led the U.S. mountain runners to the team gold during the World Mountain Running Association (WMRA) championships at Ponte di Legno, Italy. 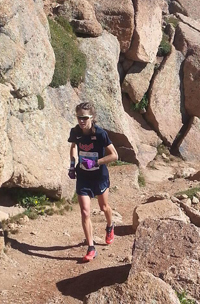 On Saturday, the Pikes Peak Ascent competition doubled as the 11th annual WMRA Long Distance Challenge and Arritola once again was a leader in an American team victory. Arritola (2.35:39) finished second overall among 599 women and helped a 1-2-3 Team USA sweep of the top female positions for a combined American finish of 7.49:49 among its top three finishers. Second-place Italy (8.36:48) was 47 minutes behind. The Pikes Peak women’s winner was 23-year-old Allie McLaughlin of Colorado Springs, Co. in 2.33:42, less than two minutes ahead of Arritola. McLaughlin was 28th overall of 1,683 finishers and Arritola placed 34th overall on a sunny, mild and windless morning at high elevation. McLaughlin’s winning time for the $2,000 first prize was the third-fastest in Pikes Peak Ascent annals. Grand Junction’s Kim Dobson, then 28, had a 2.24:58 time for the victory in 2012. Arritola averaged 11:41 a mile for her $1,200 second-place prize. The 1-2 finish for McLaughlin and Arritola duplicated their 1-2 result at the U.S. National Championship staged July 6 on a 4.8-mile course at Loon Mountain, Lincoln. N.H. That event was the qualifier for the upcoming world championships. Placing third for Team USA on Saturday at Pikes Peak was Shannon Payne, 28, of Colorado Springs in 2.40:28 for $600. Other team members were Stevie Kremer of Crested Butte, Co. 2.43:16 and Nuta Olaru of Longmont, Co. in 3.06:05. It was the third head-to-head meeting of McLaughlin and Arritola this summer as the two U.S. leaders continue to push each other towards Italy. They are due to be joined there by teammates Kasie Enman, 34, of Huntington, Vt. and Megan Deakins, 24, of Mountain View, Ca. Arritola rallied from behind and nipped two-time Univ. of Colorado cross-country All-American McLaughlin in a photo finish at the Vail (Co.) Pass Half Marathon June 7. Saturday’s Pikes Peak men’s winner on the ascent from 6,300-foot Manitou Springs to the summit was Sage Canaday, 28, of Boulder, Co. in 2.10:03—leading the Team USA men to the gold medal at 6.33:58 over silver medalist Italy (6.55:36). The Wood River Valley boasted two other female finishers in Saturday’s challenging Pikes Peak Ascent. Kathy Morell, 53, of Ketchum placed 474th overall and the 99th woman in 3.53:49, for ninth place in the Women’s 50-54 age class. Tizz Miller, 46, of Bellevue finished 501st overall and the 109th woman in 3.55:45, 11th place in Women’s 45-49.